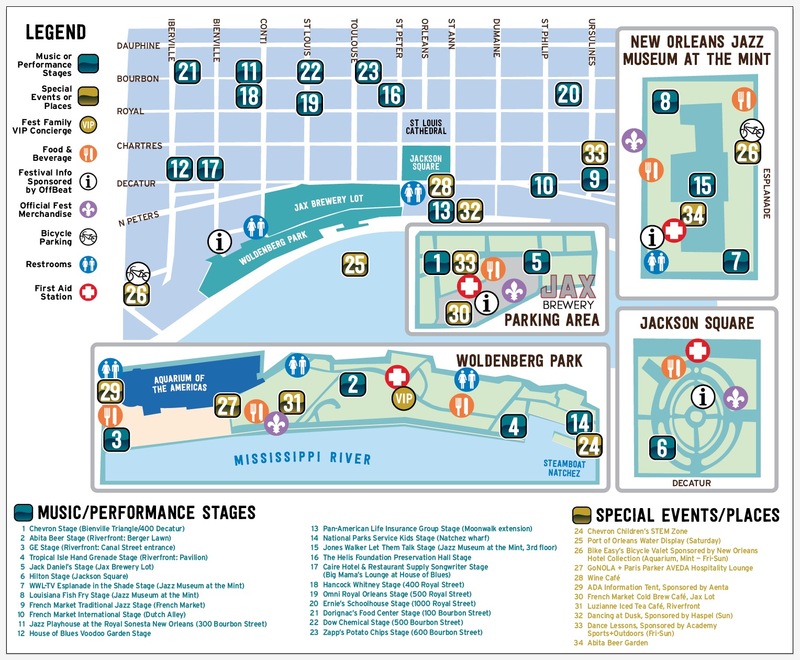 Click here to view our printable map, which provides stage, special event, and food vendor locations. Our free app is also available in the App Store and Android Market. The Omni Royal Orleans is the official hotel of French Quarter Festival and Satchmo SummerFest! Located in the heart of the neighborhood, the hotel hosts one of our 20+ stages right outside their door! Click here for special rates and offers. Locals know that getting to Festival is easy, but parking is challenging. Arrive early to park in these lots located in the heart of the festival: French Market, 500 Decatur Street, 300 North Peters Street, 211 Conti Street, The Garage at Canal Place, and various locations within walking distance. New Orleans also has convenient public transportation, including the streetcar and RTA buses. The new Loyola Streetcar line conveniently has stops near several parking lots in the CBD and drops off steps away from the French Quarter. Premium Parking has thousands of spaces along O’Keefe Avenue in the Central Business District, just a block away from RTA streetcars and buses. The following are easy access routes to downtown and the areas surrounding the French Quarter: #10 Tchoupitoulas, #11 Magazine, #55 Elysian Fields, #57 Franklin, #91 Jackson/Esplanade, #2 Riverfront, #12 St. Charles, #47 Canal/Cemeteries, #48 Canal/City Park Streetcar, #49 Loyola/UPT. For more details and fare information please go to www.norta.com. Fares can be purchased from the conductor or in advance at one of the RTA’s ticket vending machines -located at major transfer and boarding points throughout the city. Vending machines accept cash and coins only, and provide the option for $3 unlimited ride “Jazzy Passes”. Bike Easy Valet, sponsored by New Orleans Hotel Collection is available Friday-Sunday. The service is located at the Canal Street entrance to Woldenberg Riverfront Park. “Do it yourself” bike parking is also available at several locations: along the Mississippi floodwall at the Conti Street and Bienville Street entrances, and at Louisiana State Museum’s Old U.S. Mint, 400 Esplanade Avenue, on the neutral ground. New Orleans has many cab companies servicing the area. View all the options here. The Canal Street Ferry is conveniently located at the foot of Canal Street and provides an easy option for those traveling to or from the West Bank. FQFI has partnered with KultureCity to improve our ability to assist and accommodate guests with sensory needs. Our objective is to provide an inclusive and seamless experience for all guests for all events including those with sensory needs. We strive to raise awareness of the needs and challenges faced by individuals with sensory processing disorders by supplying our Team Members with continuous training and by offering the resources and accommodations below to our guests. SAVE Vehicle: the SAVE vehicle is Kulturecity’s mobile sensory inclusive room. Designed for guests to an event to take a short sensory break in it, the mobile sensory inclusive room offers a quick refuge from potentially overwhelming sensory stimuli. The SAVE vehicle will be located next to Audubon Aquarium, near the festival entrance gate on Canal St.
Sensory Bags sponsored by ArcGNO: Sensory bags containing special KCVIP badges, fidget tools, noise canceling headphones and other resources will be available at select locations throughout festival! Stay tuned for details.